CY is a very successful corporate legal advisor and she is a lady. When she was a child, her late mother never gave her a chance to cook or to do housework. She insisted that the daughter had to concentrate and be focused on her studies. Mum's responsibility was to be a full time housewife and the children were to do well in their education. True enough! Both the son and the daughter completed their education with flying colour. Today CY is happily married with three handsome sons and a no nonsense husband. A good wife and a mother to her family but she doesn't know how to cook. She only knows how to cook rice but sometimes she might even overcooked it. Sad ah? Luckily the soft spoken husband could cook. If he doesn't cook at home, then the family has to eat outside. The children never have a chance to taste mother's food. To me Mother's Food is very important. It's the mother's cooking that could draw the attention of the entire family. One day when her sons are all grown up, and they might be staying afar, the mother's food could easily attracts them to come home again. 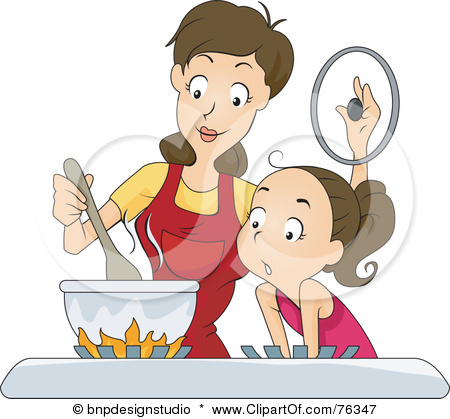 All mothers who cook, know the taste buds of their children. Money has motivation but good food is always tempting too. So! If CY doesn't cook, she has to make sure she is rich and wealthy till the end to motivate the sons to come home in future. Otherwise without wealth and no mother's food, I'm worried for her... wondering whether the children who are married then would still be attached to this old lady there after. Why am I so concerned for CY? Reason... Because she is one of my obedient daughter in law. Forgotten to write. She repeats the same mistakes of what her mother had done to her. Now her children have to concentrate in their studies as well, and leave the house work to the maids. Is she right? You tell me please! Would you agree... "Good food and a warm kitchen are what makes a house a home." I am surprised that you are telling the public that your daughter-in-law is unable to cook apart from cooking rice! Have you ever take a moment to ponder before writing such revelation? Why are you zeroing on her specifically? Wouldn't it be better to write that "some" ladies do not know how to cook instead of "my daughter-in-law"? There are thousands of people who are successful in their working life and who can barely boil water. For varied reasons, many of them never learned cooking skills and happily get by without them. There are plenty of others, too, who know how to cook, but prefer not to do it. Basic rule when it comes to cooking: "If it takes longer to cook than it does to eat, please don't cook." Life is short. That is why we take up life insurance. Why cook when there are people around willing to cook for a living? Life is full of choices. Some prefer to cook for other people and some prefer not to cook. Therefore, on your part my dear darling, learn to accept everyone's way of living, ok? Logic and common sense when one has to eat for decades at home, obviously mother's cooking is the best. Taste buds and subconsciously, the mind has been conditioned with mother's cooking, what else, mom's the best! What rights have you to kid around when a child has evolved into an adult? Grow up man, sir...if indeed you have really grown. Are you having trouble in your relationship with your daughter-in-law? Join the club. It’s not at all unusual to fin yourselves conflicting together in this difficult relationship. The daughter-in-law relationship is one of the most complicated human connections. It comes with a built-in conflict before the relationship even begins: two radically different views of the same woman. One man always will see her first as a woman; the other always will see her first as his child. When two men who love the same woman are thrown together, the results aren’t always pretty. Mutual understanding and wise negotiations are required to help both father-in-laws and daughter-in-laws fuse healthy relationships with each other. When your son marries, it’s an outsize high to know that another woman loves your child so much she wants to spend her life with him. On the other hand, you’re expected to let go of someone you have poured your heart into for decades. You have family obligations but no benefits from shared history or values, along with stereotypes: FiLs who long to give advice no one wants and DiLs who feel marginalized and worry that their husband’s father want to have contact only with their sons and be the person he consults with first about major life changes. Robert, do remember that your son’s wife has her own father. Please don’t take it personally if she doesn’t cook. Didn't know this post could capture so much of attention! I have a feeling those who had commented is actually the same person. Most likely is a brave lady again. She could be right!She had the right to write how she felt and I wrote what I feel as well. The articles I had written are the truth from my heart and mind. I doubt my daughter in law would be angry with me. Coz I treat her more than a daughter in law. Except I wish she could learn to cook from now onward. In life nobody could be prefect. Including myself! And that is why I opened my post for everyone to share their views and comments. I hadn't deleted any of my readers' comments, except the spam one. Because I too would like to learn from my intelligent readers all over the world. Thank you for sharing your thought dear She. I agree that "good food and a warm kitchen are what makes a house a home". In fact, in my family, it is difficult to gather everyone home for a dinner unless planned for special occasion such as birthday, cny, etc. Thus, my brothers and I will receive calls from our beloved mom to go home for a dinner because the seafood are cheap or the refrigerator food is expiring and she wanted us to help her clear the food. Well, we all know its just an excuse but we never fail to gather home for the simple home-cooked dinner. Mom's cooking that sends a message of more than just food. Besides, helping around on housework strengthen the bonds between family members, specifically among siblings. A lady can be successful in corporate world, but should never ignore the basic roles of a woman. I'm also a terrible cook but practice makes perfect, right? Hope your daughter-in-law will understands your concern. You mean it in a good way. You're no doubt a great father-in-law. No matter what century we are in, there is no excuse for not being the basic roles. This applies to all; man, woman, children, mothers, dad, grandparents. A lady can choose to take up roles of a man but this does not means that the lady are excused from being a woman. Same applies vice versa. Elders should set a good example for the children to follow; and it is for the better of future society as a whole. No hard feelings on this. Just a thought of my mind. In case readers are wondering, I'm from Gen Y. You are a good daughter for sure. Don't really know whether u are already married or not, you make a prefect daughter in law, mother and a loving wife. Thank you for writing such beautiful thought here.